Oregon’s Columbia River Highway was the first scenic road in America to be designated as a National Historic Landmark. It is particularly noted for its colorful displays of fall foliage and its many waterfalls year-round. The route allows for access to the Columbia River Gorge, which cuts more than 4,000 feet deep into the Cascade Mountain Range. Rich in both animal and plant life, the area along the road is home to more than 100 rare species, some that only exist in the gorge. Various hiking trails dotted throughout offer access to otherwise hidden waterfalls and views. The highway was modeled after the scenic roads of Europe and has been long recognized for its excellence in engineering and design. Most of all the road is a path leading into some of the most beautiful scenery in North America. Outside of its wide vistas and expansive overlooks, hiking, biking, fishing, and sailing are all popular activities to immerse yourself in the surrounding nature. The Columbia River Highway is located on I-84, about an hour’s drive from downtown Portland. Fall colors are brightest in mid-October and waterfalls most scenic during Spring. The route begins at exit 17, from the historic town of Troutdale, and runs for 75 miles. It takes 3-5 hours to drive in full. The 85-mile (137-km) long Columbia Gorge NSA would be a national park if it weren't a critical transportation corridor. It features waterfalls, mountains, monoliths, terraces, resort towns, vineyards, orchards, and The River, harboring a plethora of fish and birds, and a community of plants and invertebrates that changes dramatically going from the west end to the east end. Overlapping this is the Columbia Gorge AVA, the lovechild of the Columbia Valley and Willamette Valley AVAs. 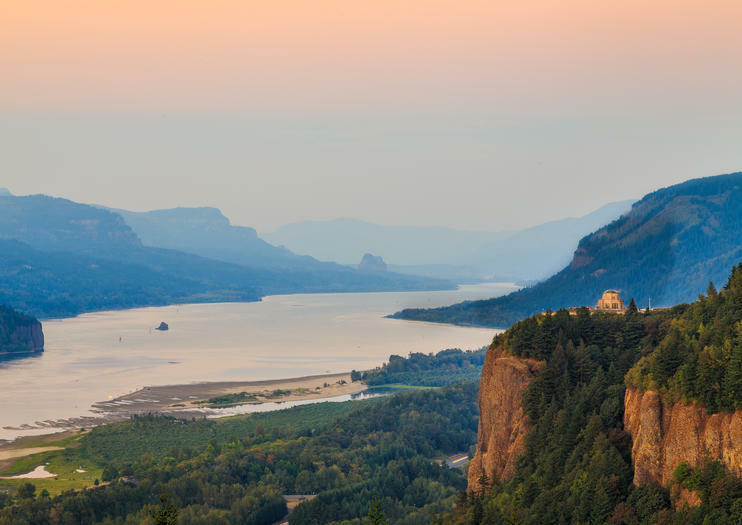 You will get intimate with The Gorge through hiking, wine tasting, and a visit to the Columbia Gorge Discovery Center & Museum. Your expert guide, with formal background in ecology, natural resources, and wine, will teach you about the natural history, cultural history, and wine background of the area. The guide will feel out the group’s physical abilities and tastes in choosing 1 to 3 hikes and 1 to 3 wineries, with a lunch stop at the Columbia Gorge Discovery Center. We cover lunch, you cover tasting fees.